So, you want a few members of your organization to shape up and behave like everybody else. Or you wish the people around you would stop following the flock as much as they do. 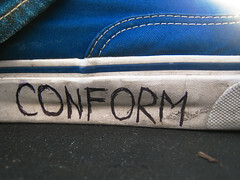 You want people to conform, or to stop conforming. If only you could do something to encourage that! You guessed it… you can. A number of factors influence the degree to which people conform to group norms and changing these factors can change their behaviour. Here’s a rundown of some of the more useful ones. How important and how difficult is the project? A 1996 study by Robert Baron, Joseph Vandello and Bethany Brunsman found that when doing something relatively easy, telling people that their task was important made them more likely to hold onto their own opinions. With more difficult projects, however, knowledge that the work was important made people more likely to conform to group opinions. Application: By emphasizing the work’s importance, you can increase individual conformity in a difficult job or project, or decrease conformity in an easy one. How big is the group? Different studies have found different numbers, but in general it appears that you need at least 3 other people to influence someone to conform. Application: Change a group’s size to 3 or fewer people to encourage nonconformist thinking or 4 or more people to encourage agreement. What mood is the group in? In general, a positive mood increases conformity while a negative mood decreases it. Are the group members similar? As we saw in an earlier post about towel usage, people are more likely to conform to a group norm if that group includes people who are like them. Application: Keep group members similar to encourage conformity or dissimilar to encourage individual thinking. Do they like each other? James Dittes and Harold Kelley did a study in 1956 that found that individuals who felt accepted by the rest of the group found it easier to express opinions that didn’t match the group’s. Individuals who did not feel accepted were more likely than others to conform to group opinions, at least publicly. Does anyone disagree? If even a single other person disagrees with the majority, an individual will be more likely to maintain his or her own opinions, especially if the dissenter speaks up before the rest of the group have established a consensus. Application: To encourage conformity, keep dissenters out of the group; to discourage it, make sure at least one group member disagrees with the group consensus. How often has the group addressed the issue? A 1954 study found that if a group opinion was going to influence an individual to conform, they did so within the first 5 times the individual encountered that opinion. Further exposure to the same information didn’t affect conformity after that. 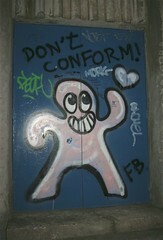 Application: If you want individuals to conform, expose them to group opinions more than once (up to 5 times). If you want them to avoid conforming, don’t repeatedly expose them to the same group opinions. Many other factors affect our opinions in various ways, and I’ll discuss several of them in future posts. For now, I’d be intrigued to hear whether your own experiences in groups match or contradict the patterns that researchers have found in these experiments.